Another vehicle collides with yours, causing gas to explode. A “controlled burn” of nearby brush gets out of control. A faulty space heater sets your apartment ablaze. A nightclub catches fire and burns numerous guests. Inadequately labeled chemicals in the garage explode. A faulty water heater causes your baby’s bath water to overheat. Serious burns, in other words, can occur in any personal injury situation. 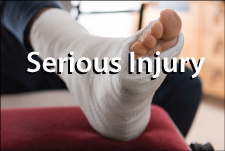 If you suffer severe burns, you will want a lawyer experienced and successful in winning these kinds of accident cases. Because of all these issues, the lawyers at Chambers & Noronha often seek record damages for victims of negligence. We file claims for medical expenses, lost earnings, pain and suffering, scarring, loss of use of body parts, emotional damages, and in cases of wrongful death, funeral expenses and loss of consortium. If you or a loved one has been badly burned you may be entitled to compensation. Our attorneys can help you solve financial issues arising from this accident. Call Chambers & Noronha at 714-558-1400 with your questions — or ask them by email.